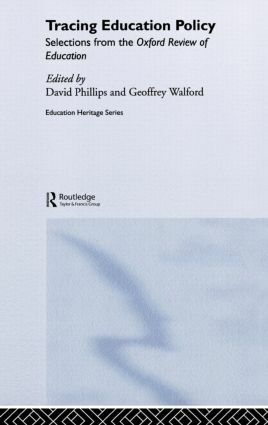 This book brings together key articles that trace the development of British education policy since 1975 and provides a valuable route map to developments within education policy during this period. It includes twenty-six seminal articles from the Oxford Review of Education written by many of the leading authors in the field and covering issues and topics with a wide significance beyond Britain. the structure of the educational system. The book has been compiled by the current editors of the journal to show the development of the field, and their specially written introduction contextualises the selection and introduces students to the main issues and current thinking in the field. David Phillips is Professor of Comparative Education and Fellow by Special Election at Oxford University, UK. Geoffrey Walford is Professor of Education Policy and a Fellow of Green College at the University of Oxford, UK.